The Art Gallery of South Australia was founded in 1881. It is currently home to over 35,000 works of art making it one of the largest collections in Australia. Located at North Terrace, the gallery is easily accessible and lies close to several other tourist attractions. The collection includes several forms of art from all over Europe, Asia, Australia and the Americas with dedicated galleries for works from South East Asia India and Japan. Here you will find paintings, prints, photographs, furniture, ceramics, jewellery, sculptures and lots more from present times and dating back to colonial times and the Renaissance period. A must visit attraction is Adelaide for art aficionados and those interesting in learning more about the evolution of culture and history through art. The gallery also displays a number of visiting exhibits every year. There is a gift shop and restaurant on the premises. Home to one of the largest and diverse art collections in South Australia, this Art Gallery charts among the most frequented tourist destinations in the country. You do not need Art Gallery of South Australia Tickets to visit the place. 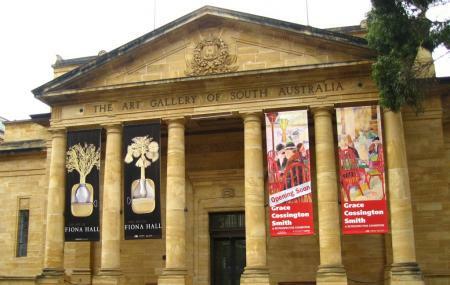 Though, there are no Art Gallery of South Australia Ticket Costs for the visits, Art Gallery of South Australia Ticket Prices are need to be paid for certain exhibitions. You can get more info about the Tickets for Art Gallery of South Australia by visiting the website. Ensure to Buy Tickets for Art Gallery of South Australia Exhibition beforehand to avoid unnecessary hassles. The Art Gallery allows still photography for personal use only, using hand-held cameras in non-restricted areas. The use of flash or video cameras is prohibited. Wheelchair and pram access is available to all areas of the Art Gallery. One can download the free gallery app for self-guided tours. General admission is free but charges apply for some exhibitions. Free guided tours - 11 am and 2 pm daily. Lunchtime talks - 12.30pm daily. Art Gallery Food and Wine is open every day from 8 am to 4.30 pm. The Gallery Shop is open from 10am to 4.45 pm every day. How popular is Art Gallery Of South Australia? People normally club together Adelaide Botanic Garden and Migration Museum while planning their visit to Art Gallery Of South Australia. Saw a fantastic exhibition at this Art Gallery, then spent rest of the day taking in the free areas of the gallery (art, textiles). Plus a snack in the gallery's cafe, plus browsing in the gallery's gift store - rounded out the day nicely. Seriously - the gallery gets great visiting exhibitions so it is worth checking their calendar. The gallery is specific and beautiful. It's a walk through of the influences on Australian art. The Quilty exhibition was fantastic as well, however the guide wasn't as knowledgeable as I would've liked, however it didn't take away from the experience and personal interpretation of the works. They also had a wonderful self-portrait crayon area for all ages and we had a great time drawing ourselves and each other. In a city that is devoid of any cultural depth. This is a shining beacon of what the place can achieve... A beautiful building with well thought out exhibition spaces and a nice venue for the day explore all the level! Great work Adelaide arts!! Always a fantastic use of space, a great collection, calm ambience, and a good little cafe near the gift shop. There is enough variety and shifting exhibitions to be able to make visits every few months and be equally entertained. Just stopped by for a quick lunch which was quite expensive for what it was. The kid's chocolate frog and mousse, @ $10, was nothing short of a bloody ripoff. The dip and the fat chips were tasty.